Of Falcon and formerly of Northam. Passed away peacefully on the 4th of April 2019. Loving wife of Colin (dec). 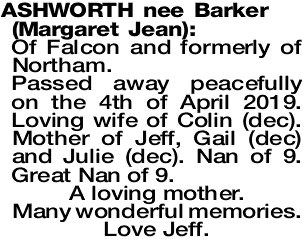 Mother of Jeff, Gail (dec) and Julie (dec). Nan of 9. Great Nan of 9. A loving mother. Many wonderful memories. Love Jeff. 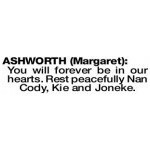 The Funeral Service for Mrs Margaret Jean Ashworth will be held in the Christ Church Anglican Church, 1 Sholl Street MANDURAH commencing at 11:00AM on MONDAY (15.04.2019). The cortege will leave the Church at the conclusion of the Service and arrive at the main entrance of LAKES Memorial Park Cemetery, 115 Stock Road, Parklands at 12:15PM for a Burial Service. 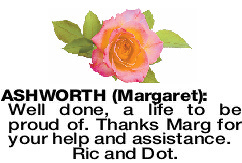 Dearly loved sister and travel mate of Betty and Rob. 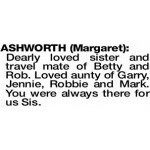 Loved aunty of Garry, Jennie, Robbie and Mark. You were always there for us Sis. 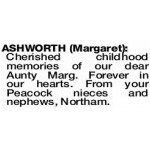 Cherished childhood memories of our dear Aunty Marg. Forever in our hearts. From your Peacock nieces and nephews, Northam. 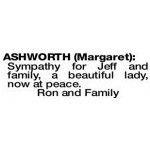 ASHWORTH MARGARET Sympathy for Jeff and family, a beautiful lady, now at peace. Well done, a life to be proud of. 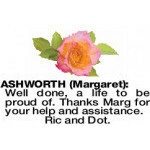 Thanks Marg for your help and assistance.